Five people showed up for the supper club set up by Daydream Kitchen and social became personal very quickly as we all sat around a large table in someone else’s living room. We tried the recommended chilli and sun-dried tomato bread by Mark which we dipped in olive oil and balsamic vinegar. Mark is of ‘Mark’s Bread‘ and Sam the chef was starting work there from Monday. Tonight, however, we were at Sam’s house and all were a bit nervous at taking part in a Come Dine With Me setup without the cameras. I told people at work about this supper club and their first question was are you going alone? No, I assured them, I’m going with a friend but it was still a bit nerve wracking. Much mention was made of Cloak and Dinner at the supper and my friend and I were the only ones who had attended. The chef had only heard about it after it was finished but it was in the spirit of non-traditional dining that this evening’s club had been created. Unlike the aforementioned charming anarchic squat, all the cutlery and crockery matched and there was a very distinct restaurant feel to the evening. There was lovely service provided by the chef’s girlfriend and a friend visiting from Leeds. We were left to our own devices for most of the time but managed to glean bits of information in between the courses. The first one was chicken liver parfait on melba toast with a golden layer of a butter concoction that sealed it on top. The starter was served as a chilled square on the plate displaying much similarity in appearance to a chocolate mousse. The texture was creamy and smooth while the butter topping was delicious though firm. 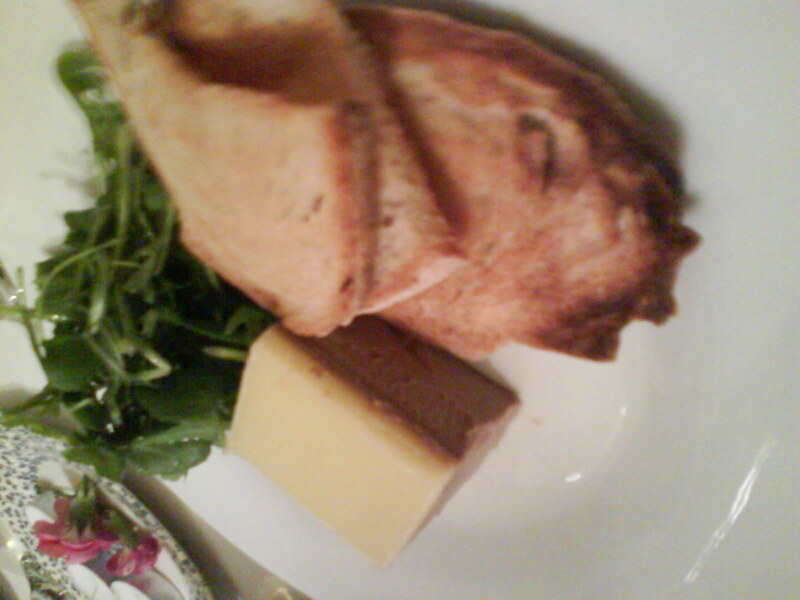 The pate-like parfait was flavoursome but not overly so and was made milder with the addition of the butter. If a complaint was to be had it was that three pieces of small melba toast weren’t enough and I had to use some of the fresh bread to finish off the dish. The bread was just slightly piccante and the chilli pierced through just a little more with every bite. We brought our own wine and I chose an Australian white wine, Dry Muscat by Brown Brothers. Slightly sweet and tingly, it suited the menu we had been sent three days previously. The starter was served alongside a lemony salad of winter leaves. 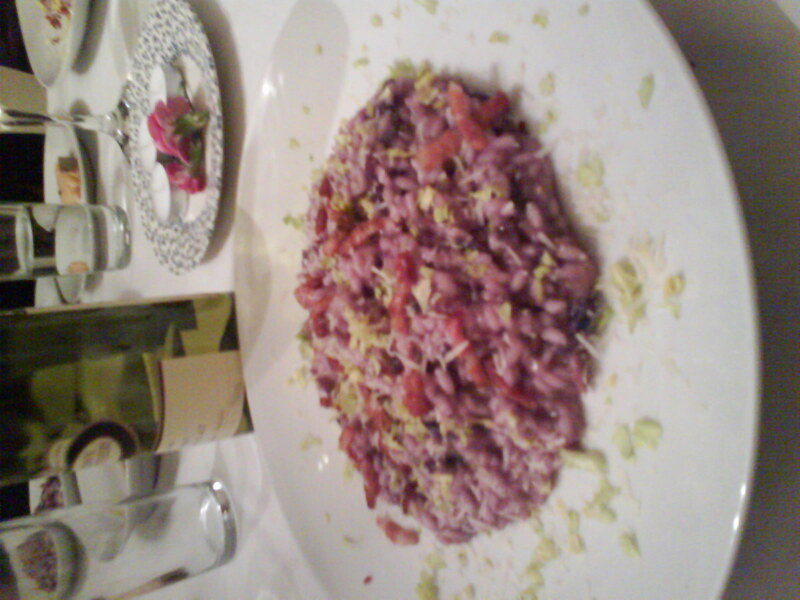 The risotto took a little while to arrive but when it did it was quite a treat. The colour was a dark pinkish hue, made so by red cabbage, and sprinkled with pancetta, parmesan and flecks of light green cabbage around the plate. We all decided that the texture of the rice was al dente and it meant that the rice was well done enough to be a pleasure and distinct enough for each grain to be felt without it being bitty. The original menu promised chestnut but it was a tough season to obtain it so we did without. The dessert was meant to be a bit of a surprise and it was unusual, intriguing and fun. 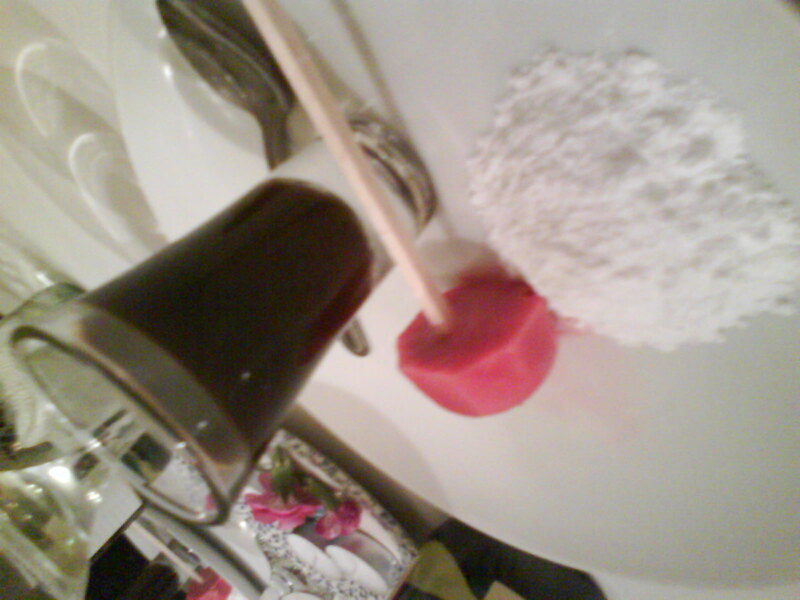 Its name was sherbert dib-dab and it was a little mound of sherbert (pencil in many cocaine jokes, mirth and general joviality), a blood orange sorbet, which included mascarpone, on a stick like a lolly, and a licorice jelly in a shot glass all served together. The English people at the table informed me that sherbert and licorice have a history of appearing together in this way but it was new to me. The sherbert was made on the premises with the use of bicarbonate of soda and citric acid. Hard to find citric acid apparently due to its amphetamine making connotations (queue much chortling) so this one had been obtained from a wine shop on Gloucester Rd. There was the occasional spluttering over the sherbert, even by the chef once he joined us, so maybe a slight reconsideration of the formula would be in order. The sorbet and licorice jelly were a superb combination and the end was a lovely light touch. The end of the food that is, because the social gathering seemed to struggle to wrap up. Along with dessert we were first joined by the chef and the waitresses which was a real pleasure. Then the housemates joined the table and for a while it was quite a nice little gathering. It was easy to forget that we didn’t know everyone and that we were there for dinner and not just a nice evening. We handed over our money unprompted and I think that a black envelope or some such mechanism would be useful in the future. The whole atmosphere was so friendly that it was quite hard for us to figure out when to leave. I felt that we should have brought a second bottle and indeed when we did leave the house we tried to find a bar to grab another drink. Alas the Louisiana was closed but I walked home alone as my friend and another guest went off to find a drink near the harbour. The supper club was promoted through Twitter and when we turned up we expected to be among strangers although that wasn’t really the case. A few people didn’t show up which is a shame because they didn’t get to hear about the Zambian kwacha. We were promised that there would be more such evenings and so it may time to set up a rule for the event. The first rule of supper club must be to talk about supper club but do it quietly and to few people. That dining room won’t fit more than 12 and I want to be able to attend the next one. 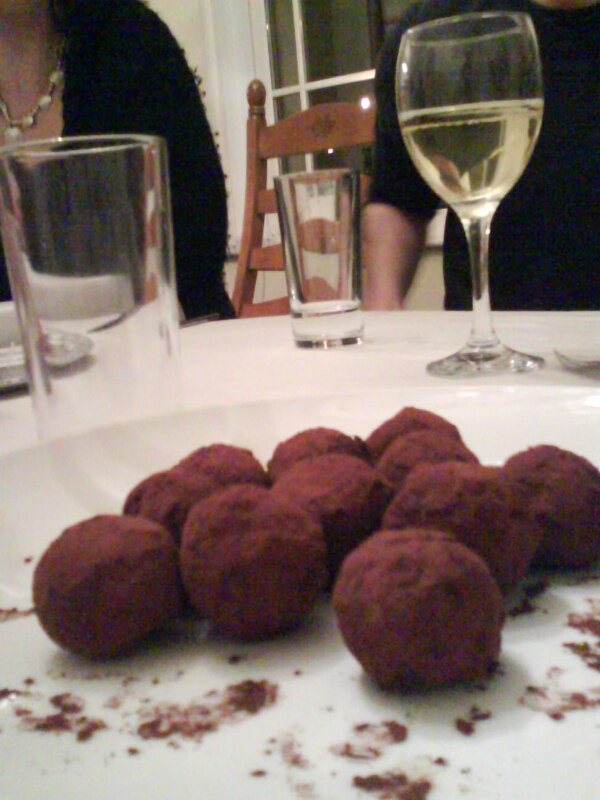 There were even silky, handmade truffles at the end. 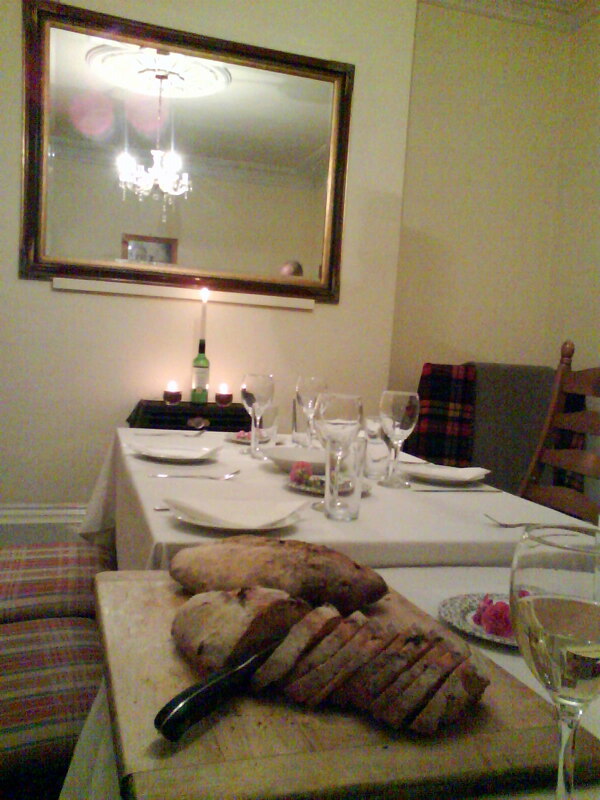 This entry was posted in Bristol and tagged Bristol, Food, review, supper club. Bookmark the permalink.